The November meeting will be at 7:00 pm on the 19th at the University of Tennessee Space institute, room H111. the scroll saw. You have seen the work he does on the scroll saw and now you have an opportunity to hear him talk about how he does it. He is very enthusiastic about his woodworking activities. Come see this program. You will be glad you did. See you at our November meeting on the 19th . Dec 13: Christmas Party: additional information will be announced at the regular meeting. Remember: the 2014 club dues are due in November, 2013. Check with Bob Addington to pay your 2014 dues. Want to know who your 2013 TVW officers are? Click here to view the 2013 TVW officers. Be sure to check out all the "up coming events" the executive committee has scheduled for the current year. Click here to view the 2013 "Event Schedule". REMINDER -- Please remember to wear your new name tag at our meeting so that our new members will know who you are. Be sure to meet all of our new members and welcome them to the club. The 2014 Exhibition will be held at the South Jackson Civic Center in Tullahoma during the first week of March. if you miss the meeting, send an email to ackerman1@charter.net to get your name on the list. The Fall Seminar was held on Saturday, October 19, with two outstanding presenters. The seminar turned out to be just as expected --- GREAT! appreciate the effort they put into the preparation and presentation of the information.Both are professional woodworkers and members of the TVW. Thanks to Loyd Ackerman, event chairperson, and to all his “helpers” for preparing the “learning environment. There were about 40 people attending and they each went away with some valuable information that can be used on their next project. elected by acclamation. The current 2013 officers will fill the same offices during the 2014 year. The club appreciates the work done by the officers in executing the plans, programs, workshops and seminars throughout the year. Be making your plans to attend the annual TVW Christmas party on December 13th. The party will be held at the Nazarene Church in Decherd. There will be additional information given at this month’s meeting. Everyone always has a great time. Put it on your calendar and come on out to enjoy a good meal and great fellowship. The carvers met on Saturday November 2 at Phil Bishop’s shop. Attendance at the November Clinic was very lightly attended by five carvers. The rest of the carvers were most likely involved with the annual wood carving show in Huntsville. Those that were at Phil Bishop's shop worked on their own projects and sorted through all the tools that Phil still has for sale. The carvers normally meet on the first Saturday of each month at Phil Bishop’s shop. Anyone interested in carving is welcome to attend these monthly meetings. The flute circle group is now meeting on Saturday mornings, still at the Artisan Shop in Cowan, to accommodate people that come from out of the immediate area. The next meeting will be November 23 at 10 AM. Please bring something to sit on and if you have something that bangs or you can keep a beat with, bring it, too. Anyone interested in learning how to play the native flute, even if you don’t have one, please come and we will take care of you. The forum is now running great. The forum is the place to “check out” and is booming with “expert” solutions to your woodworking problems and great advice. You would absolutely be amazed at the wealth of knowledge that your fellow members have to offer at a great price! Don’t forget about the tremendous resources we have in the library. If you have not tried our digital library in 2013, you are missing a great opportunity to learn new techniques and brush up on old ones. For a complete list, see Henry Davis at club meetings, email him at hdavis37@charter.net or call him at 393-3191 and leave a message. Tom Gillard – discussed the methods used to build tapered legs for a customer’s furniture, He brought the patterns and jigs that he used to cut and assemble the tapered pieces. Ross Roepke – brought a large four-drawer lidded box that he made to showcase a sheet of exotic veneer that Jim Everett recently gave him. Loyd Ackerman – brought a box that he made for his grand-daughter’s twenty first birthday. He carved side decorations using his CNC router and personalized the lid with her name. Vince Zaccardi – brought five bowls that he recently completed from cherry and spalted maple. The wood came from Karen’s Hollyberry Inn and a tree that Ken Daniels cut. The bowls were finished with spray lacquer and buffed. Chuck Taylor – brought a potpourri dish that he turned from apple wood and finished with lacquer. Doyle McConnell – brought a potpourri dish and red maple bowl that he turned and finished with multiple coats of Deft brushing lacquer sanding sealer. He found that the Deft product flows on and seals well, but it does not sand like other sanding sealers. When he tried to apply a top coat of his usual lacquer, the surface bubbled up. He finally got a beautiful finish by applying multiple coats of the original sanding sealer. Bob Reese – brought the first of twelve 2013 family Christmas presents, a set of four inlayed trivets arranged on a display frame and held in place by magnets and steel washers. Bob found that his choice of inlayed geometric designs is labor intensive, and he hopes to finish all forty-eight pieces by Christmas. Bob Addington – brought a 3-D carved plaque and a set of large letters, all cut on his CNC router. The deer scene was carved on a radius from 1.75-in stock and required ten and one-half hours to complete, with over half the time spent on the roughing cut. Bob cut six letters to go on the wall above his granddaughter’s crib and spelling her name, WILLOW. Fred Heltsley – brought three goblets that he recently turned. The first goblet was a scale copy of the Christian Church logo, and templates were used to reproduce the contours. The second copy was turned from memory at the C. C. Fair. The third goblet was turned for fun from very green hickory firewood and ended up becoming a “candle holder”, after the bowl inside diameter got larger than the outside. Jim Everett– brought four intarsia plaques, featuring an Indian, a fishing scene, a miniature flintlock rifle and powder horn, and an Indian head dress with an antique cast iron coat hook. His designs were rendered in various contrasting woods and decorated with pyrographic elements. John Duval – brought four bowls that he turned from pieces of waterlogged walnut. He described the problems he encountered with wild grain and loose bark when turning the natural-edge bowls and emphasized the value of wearing a face shield (he was hit three times during these projects). Greg Myers – displayed a scroll saw bowl. The bowl is made up of several contrasting woods and was made almost entirely with a scroll saw. Mickey Knowles – was inspired by all of the puzzles that he saw at the C.C. Fair and brought four puzzles that he made when he got home. Karen Browning – brought an antique “ironing board” coffee table that she found at a junk store. She asked for recommendations for refinishing. Tom Cowan – had several of his miniature furniture pieces on the show and tell table, but he waited to describe them and their construction during his program presentation. Click here to see the event calendar for the current year. If you have additional woodworking items for sale or are looking for woodworking items, please send information to Chuck Taylor at 931-728-7086 or email to taylorcw@bellsouth.net . It’s curtains…er, shades…for you, workbench spills! A simple solution to "messy" problems. To keep your workbench free of paint and varnish spills as well as glue drips, try this solution. 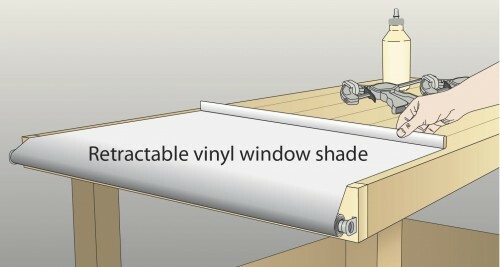 Mount a retractable vinyl window shade to one end of your clean workbench. Then, before a messy operation, pull the shade across the bench and clamp the end to the bench. Cleanup is a snap. Simply let the mess dry and retract the window shade. Much of the dried drippings peel off as the shade rolls up.